Simple, cheap and effective cork heel lifts. Ideal for leg length discrepancies and Achilles tendonitis treatments. Can be placed either under or above the insole depending on footwear type. Lifts can be simply glued together to build up to the required elevation. Cork is an attractive material for certain types of in-shoe lifts, as it is inexpensive and lightweight, and does not crush much. Cork lifts are available in a wide range of sizes and heights, and typically are covered with a leather or vinyl surface to protect the cork against abrasion and increase their life. Cork lifts are a particularly good alternative for ladies dress shoes, due to their light weight. 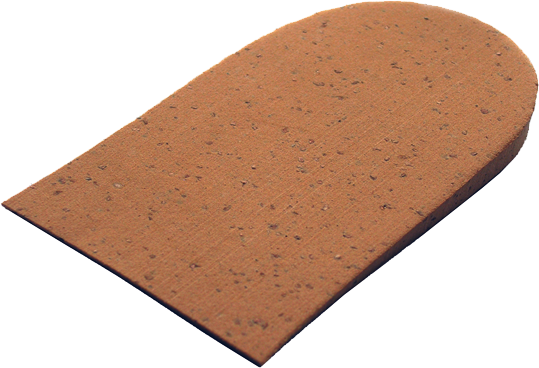 Cork heel lifts can be placed above or under the insole or heel pad of the shoe. Placing a firm lift under the insole means that your foot rests on the same amount of cushioning as in the unmodified shoe – the lift simply adds height, rather than bounce. This is particularly important for leg length compensation, where a lift is used in only one shoe – with a firm lift placed under the insole, both shoes will feel alike. Cork shoe lifts are a good choice if the user does not wish to lift the insole of a shoe in order to place the lift beneath the insole, because the slight resiliency of cork tends to be more comfortable directly underfoot than harder materials. Cork lifts are available in several widths and several heights, and are easily fit to nearly any shoe, since the material is easily cut with a knife. Cork adheres well with contact adhesives or double-faced tape to fix the lift permanently in place. The primary shortcoming of cork heel lifts is that while they are economical, they are not particularly durable. Please note: glue is not supplied with this product. Slim fit means it fits most shoes.